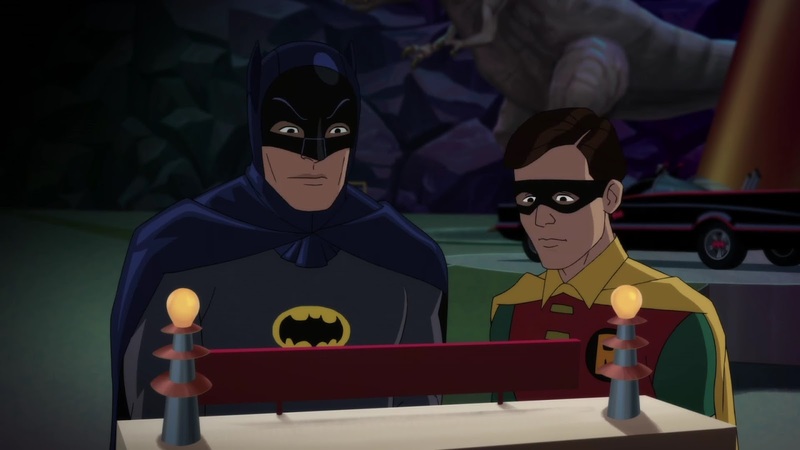 Release Date: October 10, 2016 – U.S.
"Batman: Return of the Caped Crusaders" feels like an extended episode of the classic 1960s "Batman" TV series and a love letter to that more innocent and magical time in the "Caped Crusader's" long and storied history. The most exciting news for Bat-geeks is that Adam West, Burt Ward, and Julie Newmar are back as Batman, Robin, and Catwoman, respectively. Even though it's been fifty years since the original series, they haven't aged a day thanks to the superpowers of animation. This cartoon version of "Batman" perfectly captures the feel and nuances of the 1960s series. The signature comic book-style "Pow!" "Whap!" and "Bam!" appear on the screen when the heroes collide with the villains, and the famous tilted camera angle used during the fight scenes is even referenced literally at one point. More importantly, it retains the same clean cut humor and classic one-liners that made the show so endearing in the first place. 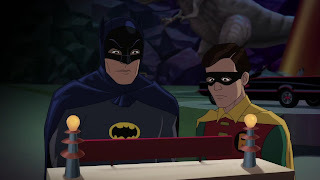 If anything, "Batman: Return of the Caped Crusaders" almost exaggerates and satirizes the purity Adam West and Burt Ward originally brought to their roles. 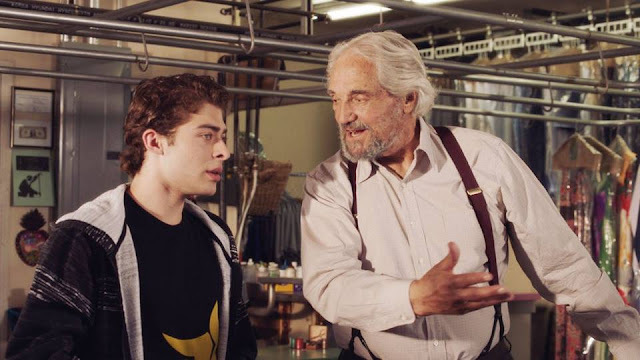 In one clever scene, they have a conversation about the perils and pitfalls of jaywalking. "Batman: Return of the Caped Crusaders" is set in the 1960s, and the movie plays around with the era in fun ways. In one scene, there's a reference to the space race (the competition between Russia and the United States to be the first country to put a man on the moon) as Commissioner Gordon and Chief O'Hara watch it unfold on TV. At first, it seems like nothing more than a throwaway nod to the time period, but it ends up being significant in ways I won't spoil. There are several other surprises too, particularly involving the heroes and villains – they intersect and crisscross in unexpected ways. Take special note of the plural at the end of this film's title. Much like the original "Batman" show, the "Caped Crusader" and the "Boy Wonder" find themselves in various pickles that seem impossible to escape from. 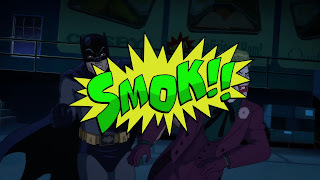 Part of me was hoping for the "Same Bat Time, Same Bat Channel" intermission we would get at the end of every episode – there were several situations where that would have fit – but this is a movie, not a TV show. My one nitpick: There were no mustache hairs showing through The Joker's paint, which was one of the gaudy highlights of Cesar Romero's delightfully over-the-top portrayal of the "Clown Prince of Crime." I've come across some silly complaints online that Adam West "sounds old" in the trailer. Well, he is 88 now. As far as I'm concerned, he doesn't miss a beat for the most part. Listening to him voice this character again instantly transported me right back to my childhood sitting in front of the TV set watching Batman and Robin fight crime and foil the baddies. As for Burt Ward and Julie Newmar, Robin sounds like he's 15 again and Catwoman is every bit the foxy feline she always was. If you preferred the Eartha Kitt or Lee Meriwether incarnations of Catwoman, let's just say there's a tiny kitty treat waiting for you – and that's not the only reward this movie has for longtime Bat-fans. There are several eggs-cellent Easter eggs – it will probably require multiple viewings to spot them all. The Joker, The Penguin, and The Riddler are back too. Sadly, the original actors – Cesar Romero, Burgess Meredith, and Frank Gorshin – are no longer with us. 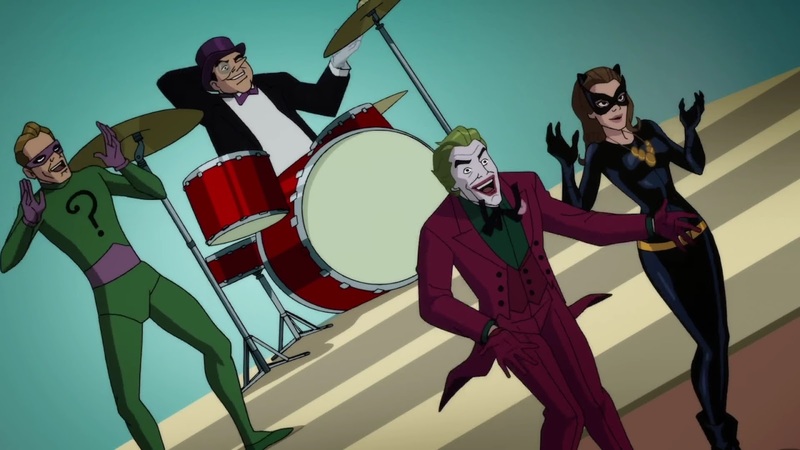 Instead, sound-alikes have been hired to take over their roles (Jeff Bergman as The Joker, William Salyers as The Penguin, and Wally Wingert as The Riddler). The same is true of the remaining regulars: Alfred (now voiced by Steven Weber, "Wings"), Aunt Harriet (Lynne Marie Stewart), Commissioner Gordon (Jim Ward), and Chief O'Hara (Thomas Lennon). To my ear, the new actors do an admirable job. If I didn't know any better, I'd swear the original cast had all returned. If the performances are not exact, they're at least close enough. The worst thing a replacement voice-actor can be is a distraction, and that's never, ever the case here. After viewing the "extra" following the film, I became even more impressed. None of the actors playing the villains look or sound anything like their characters in real life. Steven Weber – who voices Alfred – isn't interviewed for this bonus segment, but I'm familiar enough with his work to know that he doesn't even remotely resemble a posh British butler. I could not stop smiling during "Batman: Return of the Caped Crusaders." It's an absolutely joy to see these versions of the characters again and hear the distinctive voices that brought such pleasure and wonder to my own childhood.